This article was originally written for our internal staff members comprised of mostly software engineers. One of my biggest concerns when taking over as the Network Admin at Pyramid was the poor backup plan in place. File level backups via tape were incomplete (I have since resolved these) but worse was the backups taking place on the VM environment. Backing up the VM environment is becoming more critical as Production servers are moved to the Virtual Hosts. vRanger 5.2 –Inherited was 6 CPU licenses and is the legacy system for backing up the Virtual Environment. The problems with this are countless. First issue is we have 10 CPU’s on our ESX environment, meaning I’ve been playing musical licenses for the last 4 months. The cost to add 4 more CPU’s is below plus roughly $350 x 10 = $3500 annual maintenance. Message: An internal error occurred during execution, please contact Vizioncore support if the error persists. Error Message: Index was outside the bounds of the array. Message: vmlab1.pyramid-solutions.com is not licensed for the Backup feature. To top off, when the backups fail they are leaving dummy files in the data store which do not restore correctly. This results in the following on restore. Uhh ohh! So yes basically vRanger reliability bites and we pay for it!! The limits are 100 Virtual Machines and 1 TB Backup store size per VDR instance. However – you can have up to 10 VDR instances in your vCenter meaning we could support 1000 VM’s!!! The GUI is built in vCenter (does require a client install to access) and is very intuitive. only 91Gb for a weeks worth of daily backups for 10 servers. wowzers!! for only about 50 single instance backups. There are not daily,weekly, monthly archives of backups for the same server. Lastly major factor is the time required. vRanger essentially rewrites the entire VMDK file every time is takes a backup. VDR is a smart back up. vRanger only allows for 2 simultaneous backups, VDR does 8. But after that is only logs the differences so it can the be restored to make a perfectly working snapshot in time. And it backs up at a whopping 150GB/hour. vRanger on the other hand uses the initial slow rate over and over. (12GB/hr) repeatedly. Plus it overwrites its previous backup. Pyramid is saving roughly $6000 this year and $3500 annually. Time and space for backups has been reduced significantly. There is a true disaster recovery solution in place once NAS1 is replicated to NAS2(offsite). 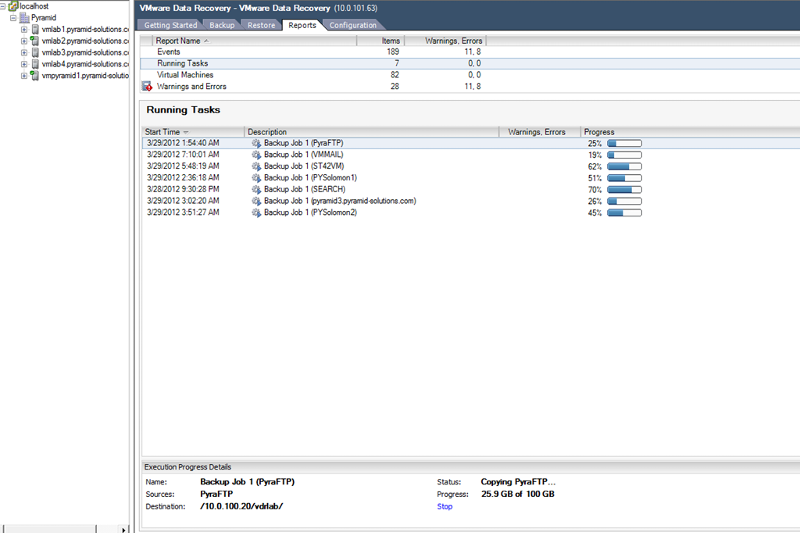 The VDR can be restored on any ESXi 5 box from scratch. We need to upgrade our remaining ESX3.5 boxes a.s.a.p. They are outdated and the backups from last month aren’t even reliable. Thank you for reading..let me know if you have an comments or concerns.